Land Rover has unveiled its 'Invisible Bonnet' technology which lets you quite literally 'see through' the bonnet of your car giving you a completely uncompromised view of your surroundings. 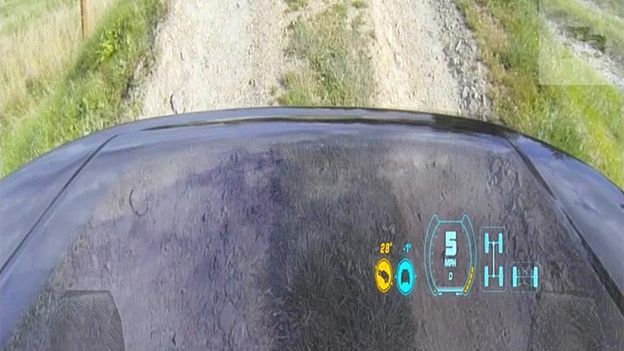 The technology uses cameras placed on the underside of the car combined with an advanced heads-up display (HUD) which then projects that live feed onto the windscreen giving the appearance that the bonnet of the car has disappeared. One of the biggest obstacles for off-road driving is the lack of visibility, particularly when attempting to traverse steep inclines or extremely uneven ground. This technology hopes to completely remove that problem by giving the driver a unhindered view of their surroundings including the ground that the car is currently on. This isn't the first time augmented reality has been used in this way - BAE's advanced fighter helmets use cameras all over the jet which are then fed into the pilot's personal HUD giving them the same level of visibility as if the plane wasn't there at all. Designed as part of a series of next-generation technologies for off-roading the 'Transparent Bonnet' will be on show as part of the Discovery Vision Concept Car which Land Rover will be showcasing at the New York Auto Show next week.